This digital-image mosaic of Mars’ Tharsis plateau shows the extinct volcano Arsia Mons. It was assembled from images that the Viking 1 Orbiter took during its 1976-1980 working life at Mars. 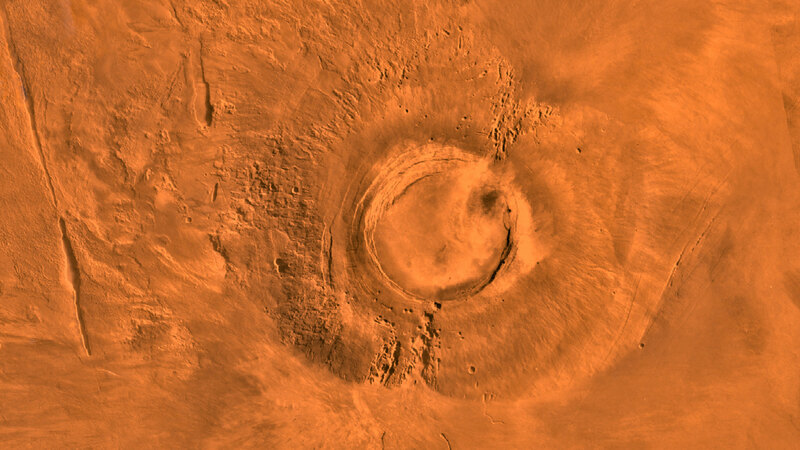 A new study from NASA reveals that the giant Martian shield volcano Arsia Mons produced one new lava flow at its summit every 1 to 3 million years during the final peak of activity. The last volcanic activity there ceased about 50 million years ago — around the time of Earth’s Cretaceous–Paleogene extinction. Located just south of Mars’ equator, Arsia Mons is the southernmost member of a trio of broad, gently sloping shield volcanoes collectively known as Tharsis Montes. Arsia Mons was built up over billions of years, though the details of its lifecycle are still being worked out. The most recent volcanic activity is thought to have taken place in the caldera—the bowl-shaped depression at the top—where 29 volcanic vents have been identified. Until now, it’s been difficult to make a precise estimate of when this volcanic field was active. The team mapped the boundaries of the lava flows from each of the 29 volcanic vents and determined the stratigraphy, or layering, of the flows. The researchers also performed a technique called crater counting—tallying up the number of craters at least 330 feet (100 meters) in diameter—to estimate the ages of the flows. Using a new computer model developed by Richardson and his colleagues at the University of South Florida, the two types of information were combined to determine the volcanic equivalent of a batting lineup for Arsia Mons’ 29 vents. The oldest flows date back about 200 million years. The youngest flows probably occurred 10 to 90 million years ago—most likely around 50 million years ago. Be the first to comment on "Earth’s Dinosaurs Went Extinct About the Same Time Arsia Mons Volcanic Activity Ceased"